Lemon meringue pie, sweet and tart all in one dessert. Once I made my first pie I was hooked. 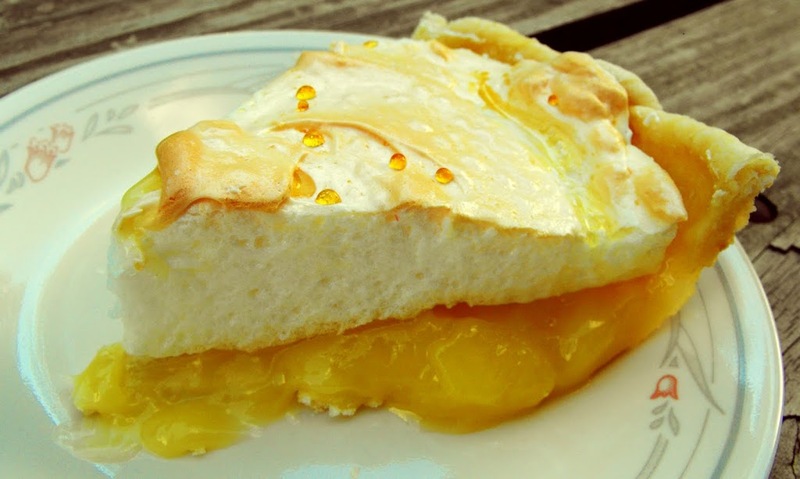 Lemon meringue is one of my favorite pies; I love the sourness of the lemon along with the sweetness on the meringue. It is just a great combination, what more is there to say. 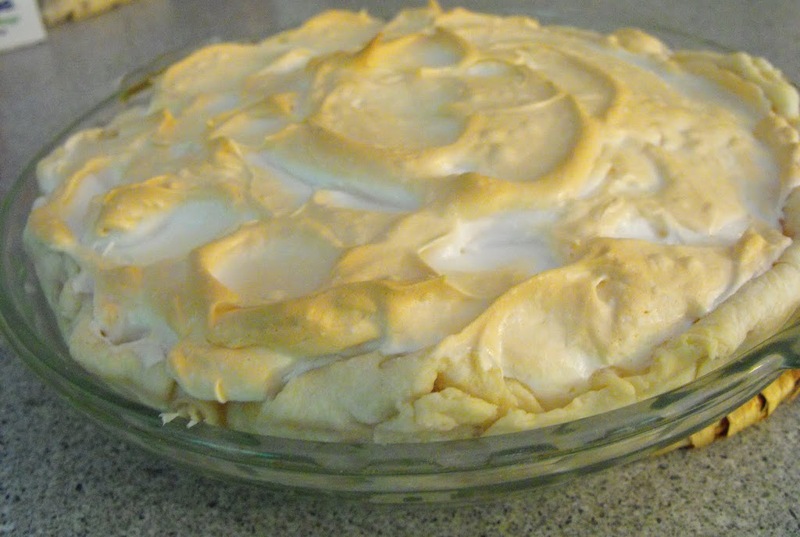 This lemon meringue pie recipe is one that my mom made when I was a kid, and now I carry on the tradition with my family. I think they love it as much as I do, it sure doesn’t take long before every bite is eaten. I hope after reading this recipe that you start a tradition of making lemon meringue pie too, and enjoy it as much as I do! Sift flour and salt together; cut in shortening with pastry blender till pieces are the size of small peas. Sprinkle 1 tablespoon water over part of the mixture. Gently toss with a fork, push to side of the bowl. Repeat till all is moistened. Form into ball. Flatten on lightly floured surface pressing with edge of hand 3 times across in both directions. Roll from center to edge till 1/8 inch thick. Fit pastry into pie plate, trim 1/2 to 1 inch beyond edge; fold under and flute edge. Prick bottom and side with fork. Bake at 450 degrees for 10 to 12 minutes or until golden brown. Beat eggs whites with vanilla and cream of tartar until soft peaks form. Gradually add sugar, beating till stiff and glossy peaks form and all sugar is dissolved. Spread meringue over hot filling sealing to edge. In a saucepan, mix 11/2 cups sugar, cornstarch, flour, and salt. Gradually add hot water, stirring constantly. Cook and stir over moderately high heat till mixture comes to boiling. Reduce heat; cook and stir 2 minutes longer. Remove from heat. Stir a moderate amount of hot mixture into egg yolks, then return to hot mixture. Bring to boiling and cook 2 minutes, stirring constantly. Add butter and lemon peel. Slowly add lemon juice, mixing well. Pour into pastry shell. Spread meringue over filling seal to edge. Bake at 350 degrees for 12 to 15 minutes. Cool before cutting. Wow does that look amazing! I love lemon desserts. 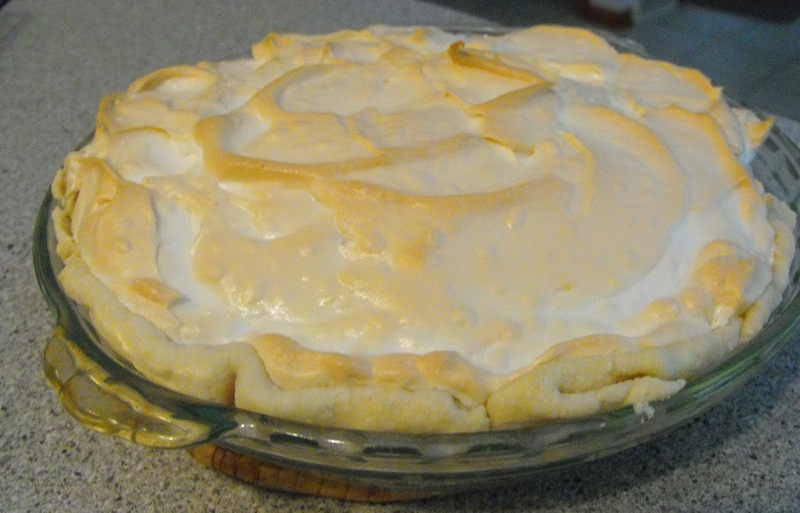 I am just learning to love making pies – lemon meringue is one I haven’t tried yet. This looks perfect! Sweet and refreshing. Oh happy day. My favorite pie ever. I LOVE it! Nice job on the meringue too. Your pie is lovely.